Write us a note and drop it in to L.E. Shore Memorial Library, or the Craigleith Heritage Depot. 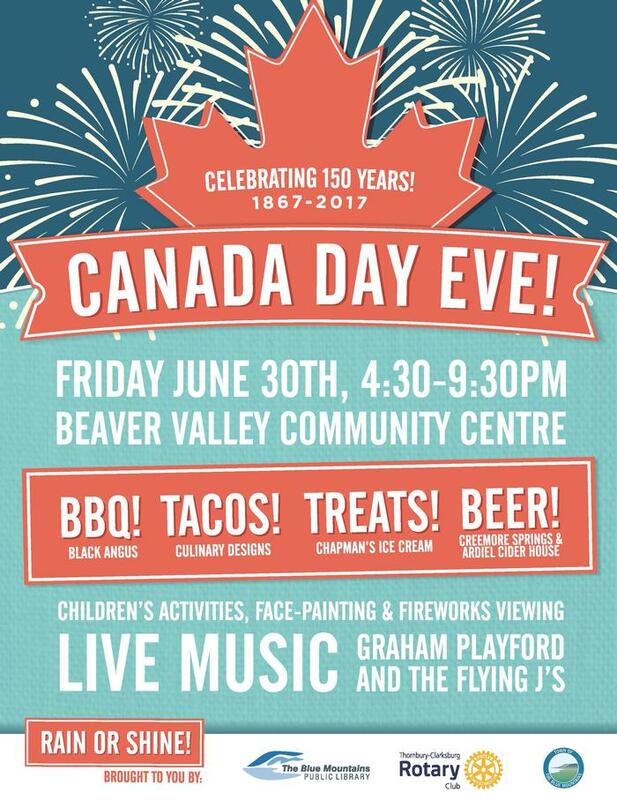 Kick off your Canada Day 150 weekend with us! This outdoor party will be hosted by the Blue Mountains Public Library, the Town of the Blue Mountains and the Thornbury-Clarksburg Rotary Club. 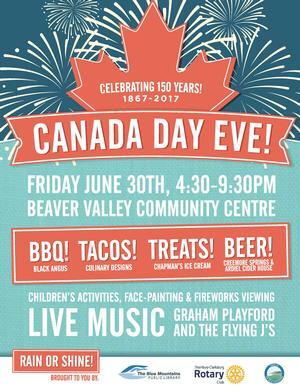 Featuring Black Angus BBQ, a Culinary Designs Taco Stand, a beer tent from Creemore Springs and Ardiel Cider House, face-painting, interactive children’s activities, an amazing local band Graham Playford and the Flying J’s and a large fireworks display at Tomahawk to end the evening. Rain or shine! We are excited to announce the availability of thousands of movies, television shows, music albums, eBooks and audiobooks, all available for mobile and online access through a new partnership with Hoopla Digital – all you need is a valid library card! Card holders can download the free Hoopla Digital mobile app on their Android or iOS device or visit hoopladigital.com to begin enjoying thousands of titles – from major Hollywood studios, record companies and publishers – available to borrow for instant streaming or temporary downloading to their smartphones and tablets. To access the system on your mobile device, you will need to visit hoopladigital.com or download the FREE hoopla digital app from the App Store on your Android or iOS device. Simply ‘Sign Up’ to get started. The annual TD Summer Reading Club Program is back and open to all children ages 3 and up. When the child comes in to register they are given a registration package of recording book, tracking bookmark, and carrying bag (inside are also additional instructions and contact information about the program). As the child reads throughout the summer they record each title in their book. When they come into the library they must bring their log book and tracking bookmark and a staff member will stamp the corresponding number of books on the bookmark. Once the bookmark is filled it is entered in the draw for prizes from local donors including Scenic Caves, Pom Pom by the Bay, and Thornbury Bakery. The more bookmarks you fill, the more chances to win! This summer we are expanding our programming to include a Summer Book BINGO for adults featuring Canadian authors and genres in honour of the Canada 150 celebrations. Every 5-in-a-row BINGO counts to be entered for your chance to win amazing prizes from our local business sponsors. Pick up your card today and let’s get reading! This is a free drop-in program focused on creating a fun and open space to explore and create. From playing and creating games, to science experiments, STEM, technology, and craft skills we will have diverse programming to offer each week. It’s officially summer! That means Story Time at the Beach is back. Join us at Little River Beach Park (beside the Thornbury Pier) every Friday for our favourite way to start the weekend! Featuring stories, rhymes, games, and crafts for ages 0-5 years. Please bring sunscreen. On rain days we will meet at the LE Shore Memorial Library. The Arts and Advisory Council for Blue Mountains Public Library is hosting the 2nd Annual Summer Invitational Show of arts and crafts. Seven established local artists were approached to represent a cross-section of styles and mediums. Participating artists will be present at the opening reception on Saturday, July 8th from 2:00pm-4:00pm in the Gallery, to greet the public and answer questions. The Summer Invitational includes Derek Scott, Ofra Svorai, Mary McTaggart, Dianne Cruttenden, Bonnie Dorgelo, Karen Cameron, and Umberto De Boni. The show runs from July 2 to August 3. Phone 519-599-3681 ext 142 or email aac@thebluemountains.ca for more information. Celebrate the international awards received for the film "Snow People". Join the award winning filmmakers and learn about our new Film Club. The L.E. Shore Library presents "King for a Day," a local documentary from Mountain Goat Film Company. "King for a Day" is a feature length film that explores the phenomenon of Elvis and how impersonating Elvis affects the culture of music in Canada and the world. Starting with Collingwood, the largest Elvis festival in the world, filmmaker Tracey Johnston delves deep into the world of fake hair, spray tan and sparkling jumpsuits. "King for a Day" explores greed, corruption and cultural abduction and asks the question of what would Elvis have to say about all of this? L.E Shore Memorial Library is hiring! Looking for student pages to work part-time, including weekends and Tuesday/Thursday evenings. Applicants should be between the ages 14-18 years old. Work includes shelving books and assisting with programming. Please email resume and cover letter to libraryinfo@thebluemountains.ca or drop it off at the L.E. Shore Memorial Library at 173 Bruce Street South in Thornbury. L.E. Shore Memorial Library will be closed Friday, June 30 and Saturday, July 1. The Craigleith Heritage Depot will be closed Friday, June 30 and will be OPEN Saturday, July 1.